Well, spring is here, I’m thankful to say and the weather in southern Ontario is improving daily. The biggest news I have to share this month is the release of my sixth book “Blood Vengeance: (Cold Case #4-183) Not of this World. Blood Vengeance is a paranormal/crime thriller, which takes place in the small town of Payson, just outside of Phoenix, AZ. Rookie FBI Agent Jeremy Jones, along with his more experienced partner, Bailey Phillips, attempts to solve a string of what appears to be kidnapping/murder/suicides. All of the crimes take place in the same dilapidated, old Victorian house - but how and why? At the same time, Jones experiences a series of strange visions that seem to somehow be related to the case. The agents fight against time to solve the crimes amid growing pressure from their boss, the media and the public. But can they catch a killer that appears to be "Not of this World?" For more information on this new release please go HERE. The book can be ordered HERE. RADIO SHOW: On May 1 at 6 p.m., I will be the guest on D’s Roundtable Radio Show on Blog Talk Radio. To sign up for Blog Talk Radio go HERE. You can then listen in on that date HERE. A call in number is posted on this page so feel free to phone and talk with me! Now on to all the paranormal news I have ready to share with you this month. This month’s story comes from Shay, who lives in the U.S. and possesses some remarkable paranormal abilities. She is a regular contributing member of my Ghosts & Hauntings group on Ellen . Often we live our lives only giving passing thought to those who have passed. A curious fascination for the other side and what happens when someone passes. Or a deep seeded desire to see what others cannot easily explain or prove. Sometimes as we are living our lives, we find ourselves in a situation where our own passing may very well be at hand until we are touched by a spirit. After the event has passed, we are left to question, "Did that just really happen? How am I still here and why? Was that really who I think it was and how could that be? That person died! Or, who/what was that? Where did he/she come from and where did they go?" The location is a small section of the Battle Creek River in Battle Creek, Michigan, where I spent much of my childhood. It is a place with a nice sized waterfall and strong rapids where my father used to take me fishing. I would fish and play in the shallows and on the bank. I would sing to the spirits and make tools such as spears and bows to play with. Sometimes my father would take me behind the waterfall and we would walk to the other side of the river to have a look around. Passing under and behind it as the water cascaded down with a crushing force. One day was different from the others. I was about 6 or 7 years old at the time. Something did not feel right and I knew something bad was going to happen. In the same instant, I also knew that everything was going to be okay. I followed my father along the path and through the old fence section with the opening that had been cut and pulled aside. We made our way over the large rocks/boulders to the waters edge. The closer we got, the more intense the feelings grew and I began looking for the danger. My father went straight to his fishing and I was left on the bank trying to figure out what the cause of my distress was. Eventually I calmed down and went to play in the shallows by trying to catch a nice sized carp I had spotted in the aquatic vegetation there. Some time had passed and I noticed that my father had smoked a couple more joints than usual and the whiskey he drank before hand was a bit stronger than his typical beer on such occasions. I thought that perhaps I was going to have to fish him out of the river but I did not know how. He was over six feet tall and weighed a lot more than I did. Added to that, the current was fierce in that section and would have him swept away before anyone could blink. So, I found some fishing line and a small piece of rope just in case. I had to try something if anything happened. But, it was not my father who was in danger. As I was playing and watching, my father stopped fishing and called me over to him. He was in deeper water than me and I had to fight against the current to get to him. As I approached, he asked me if I wanted to learn how to swim. I told him excitedly that YES, I would. When I got close enough, my father grabbed me roughly and held me up to his face. His smile was terrifying and the look in his eyes was sinister...terror gripped me as he told me to sink or swim. I started screaming and fighting with everything I had but could not break free. Then, he threw me as far out into the heavy rapids as he could. I took a deep break as I flew through the air and felt the water grab me as soon as I hit. I was sucked under and drug across the rocky bottom with so much force and speed. It hurt as my head took a rock in the side but at that very moment, I felt myself being grabbed as if protective arms had swept around me and pulled me back against the current. I thought that perhaps my father had had a change of heart and was now trying to save me. The hold changed as I now felt a force pushing me to the surface. My head broke through the waters surface and instinctively I gasped for breath. My body was being gently carried to the shallows by this same force. Then, just as suddenly as it had grabbed me, the force was gone and I plunked down under the water only to find I was in a less than knee-deep clam pool not far down stream. I told him that if he ever did anything like that again, I'd kick his azz and wait till he fell asleep to do the rest. As I stood there dripping wet and daring him to make a move, he stopped laughing and just looked at me. I don't know how long we each stood there staring into each other’s eyes but he finally hung his head down and turned away from me. He did not catch any more fish and I sat in the shallows where I felt protected by her. I kept hearing a soft voice telling me that I was safe and okay… that no harm would come to me. My father decided that he had had enough and that it was time to go... we left. I checked my head only to find a very small knot where it had been hit. This was quite surprising as all things considered I was lucky to be alive. My father never tried that again and I found myself thinking of my hero quite often. Some would call her an angel... but that doesn't feel right... she lives in the water… is apart... of the water. She is a water spirit. One of those I had sung to. What I did not know at that time was just how much of apart of my life she would become. I am 37 now and 30 years later, I can feel her in the water. I can still hear her and have even seen her many times. I love the water and swimming with her. She is beautiful and I am very grateful to and for her. She was there for my initiation a few years ago and was the one who helped me face my greatest fear... love... had it been anyone but her, I probably would have failed my initiation. She has my love and gratitude...it is an honor to call her friend. A paranormal investigator claims he is in line to win £1 million after betting he could prove the existence of an afterlife. Ross Hemsworth, 49, from Glastonbury, has placed a £100 bet with odds of 10,000/1 that he will provide evidence of an afterworld beyond reasonable doubt. If the self titled "scientific investigator of anomalous phenomena" is proved correct, not only will he bag the money but will also become one of the most famous men in modern history. Mr. Hemsworth said a team of scientists and doctors were working around the clock to prove the existence of the after life. However, he could not provide details of the evidence he is set to produce as it iss being kept "under wraps." The evidence must be provided and accepted by bookmakers William Hill before the end of the year or the business entrepreneur would lose his bet. "There is something out there trying to make contact,” Hemsworth said. "With the evidence we have got, we are not a million miles away from proving it.The whole point of the project is to prove that there is something there. More and more people are coming away from religion; there are more and more wars. If we can prove this, we hope it will make some difference to peoples' lives." He added that voice communication, video and photography would be among the evidence he would produce. And although some may think this bet is strange, apparently it’s not as far fetched as you might think. "We are used to taking bets on matters as bizarre as the existence of the Loch Ness Monster; whether Elvis Presley is still alive and when UFOs may land, even on whether ghosts exist,” said William Hill spokesman Graham Sharpe. "But this is the first time we have ever taken a bet that conclusive proof of the existence of the after-life will be forthcoming. I've no idea what that evidence may be, but if Ross produces it before the end of the year, we will be paying him £1 million." The video below was taken by the American Paranormal Research Association aboard the Queen Mary, a ship with a most haunted reputation. They captured what they believe is an image of an apparition in a changing stall near the pool. 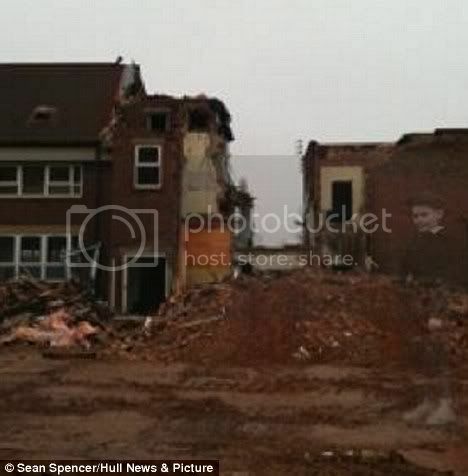 The ghostly image of a young boy appears in this photograph of demolition work at the purportedly haunted Anlaby Primary School near Hull in East Yorksire, England. Mr. Fores was carrying out demolition work on the building, which was built in 1936 and took several pictures on his mobile phone to record the demolition work. Mr. Fores said he has not altered the picture in any way. Caretaker Gordon Bradshaw, 54, said the shcool has a reputation for being haunted. 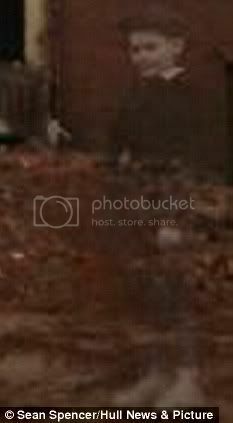 As for Rob Taylor of the Hull Paranormal Ghost Society, he said he’s never seen such a clear and distinctive picture. The film Paranormal Activity has parents and politicians up in arms in Italy after claims that several people suffered panic attacks while viewing it. An emergency services spokesman told news agency Ansa the most serious case was a 14-year-old girl "brought to the hospital in a state of paralysis." He said emergency services received dozens of calls, especially in southern Naples "where several panic attacks lasting more than half an hour took place on Saturday." The film, which was shot in the director, Oren Peli’s home in San Diego in 2006, depicts the haunting of a couple living in an apartment and in most countries, came with an age limit of 15. There was no age restriction when shown in Italy but the call is out now to raise it to 18. Italian Defence Minister Ignazio La Russa said he was concerned about a trailer for the film shown on Italian TV. "For the past two weeks, a trailer has been shown obsessively on TV and is terrifying thousands of children," he said. "It's a terrible thing. I took notice because my seven-year-old son told me, 'Daddy, I'm scared'." Culture Minister Sandro Bondi said the committee that decided on age restrictions had given the film the go-ahead, but he was now considering possible measures to protect children. Peli has announced that Paranormal Activity 2 will be coming soon. "I have some awesome news for the fans of Paranormal Activity," he said. "Director Kip Williams will join us for the next chapter of the story. We are thrilled to have Kip working with us. He is the guy we want at the helm, because he knows exactly what we want to deliver to the fans... and I can't wait to be a part of what he's putting together. I don't want to spoil the story but I promise it'll surprise you. Stay tuned." The first movie made for a mere $15,000 pulled in $151 million worldwide. The sequel began filming in May 2010 and is scheduled for release in October. The Occult & Paranormal House of Investigation Research (OPHIR) in Salem, Oregon makes sure that strange noises in a house are just those old pipes, creaky floorboards, cold spots and other normal phenomenon, rather than something that might be other worldly. They not only pore through public records, but also interview current and former residents, if necessary. There would also be a series of three on-premises paranormal probes. "We use everything from the most modern equipment available to us to the inclusion of psychics, clairvoyants and/or clergy members custom-tailored to the clients' preferences, and spiritual orientation," Powell says. "We do not charge for the paranormal investigation itself. We do that out of our passion for the field." The only fee is for the information searches and is based on amount of research, fuel costs and hours spent at various locations. For more information contact OPHIR at investigations@Team-OPHIR.com or call 971-239-5992. A prison in Holland uses psychics to help prisoners contact the dead. Employed by the Dutch justice ministry, psychics go into the prison with the goal of helping the inmates. A clairvoyant by the name of Mr. van Bree recently told De Tijd magazine that talking to the prisoners and the prisoner’s dead parents can help the inmates discover key psychological insights that can assist with rehabilitation. "With my antennae, I sometimes reveal more than a psychologist or a prison welfare officer," he said. "My work can be compared to mental health care in widest sense of the words." Paul van Bree, a self-styled "paragnost" or clairvoyant, has been hired by the Dutch prison service to teach prisoners how to "love themselves. I tell them that dead relatives are doing well and that they love them. That brings them peace. Big strong men burst into tears," he said. Experts say Aliens are Real: GO HERE! UFO researcher Robert Hastings and former U.S. Air Force Captain Robert Salas are currently organizing a press conference at the National Press Club in Washington D.C. to address the vital issue of UFO incursions at U.S. nuclear weapons sites over the past six decades. The purpose of the event is to focus worldwide media attention on the reality and importance of the situation. To date, more than 100 former or retired U.S. Air Force personnel—once trusted to operate or guard weapons of mass destruction—have come forward and revealed ongoing UFO surveillance of, and occasional interference with, our nuclear weapons. This information alters the historical perspective on the nuclear arms race and much, much more. The fact that the Pentagon and CIA have successfully kept the truth from public view for so long is in itself mind-boggling. While most of the reported UFO incursions apparently involved simple observation, a few of them resulted in the shutdown of large numbers of nuclear missiles. This is more than a Cold War issue because these incidents continue to occur. Media reports of UFO activity at nuclear weapons sites have been published as recently as March 2009. Nuclear weapons proliferation is an ominous and crucial concern, affecting all of humanity. When combined with the secrecy surrounding UFO phenomenon, there exists a nexus of enormous importance. At the press conference, scheduled for September 27, 2010, a dozen ex-USAF personnel, including Mr. Salas, will discuss their nukes-related UFO experiences. By way of introduction, Mr. Hastings will briefly summarize his 37 years of research on the UFO-Nukes Connection. Following the statements of the witnesses, Mr. Salas will offer concluding remarks. The assembled members of the media will then have an opportunity to ask questions for an extended period. ""It's not that I'm afraid to die. I just don't want to be there when it happens." as well as afterward. Learn the tips & tricks to success. Check out this informative e-book that will save you both time and money Here. Reviews: UFO Digest, Alternative-Read, Amazon.com. 2) Playing With The Devil: a true story of the horrid abuses suffered by 12 children in one Canadian family is also available at various sites. Available now at Saga Books and Amazon.co.uk..
3) Talking To My Angel a lovely children’s book for little ones who have experienced angel visitations and/or invisible friends is available Here. If you order now, you will also get a free Angel Pin! 4) The Man With The Magic Spectacles< is temporarily unavailable. 5) Glimpses: True Stories of the Paranormal: Available by contacting me. 6) Blood Vengeance: (Cold Case #4-183) Not of this World: Now available from Saga Books and Amazon.com! 7) Totally Scared: The Complete Book on Haunted Houses: This manuscript is now being reviewed by another publisher and we hope to have good news soon. Please visit the promo site Here. Yesterday is history, tomorrow is a mystery. And today? Get all you’ll ever need Here! for just $6. for 5 lines or a banner. Would you like your own website and a newsletter just like this one? Solo Build It blows away old-fashioned site and newsletter building. Take the SBI Video Tour Now! Ready to get the total SBI experience? Click Here! Copyright © 2008 by Martha Jette - All Rights Reserved.